Sunreef Mooloolaba, based in Queensland’s Sunshine Coast, is the longest established dive centre in the region, with roots starting back in 1976. Sunreef is a Five Star PADI Training Centre and offers accredited dive courses for all levels of divers as well as local reef dives, snorkelling trips and diving on the ex-HMAS Brisbane and beautiful Flinders Reef. 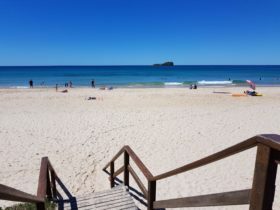 Sunreef Mooloolaba also offers whale watching from June to November as well as Australia’s first Swim with Humpback Whales experience, from July to October each year. The crew also guides international dive trips and travel as well as offering dive equipment sales and servicing. For more information on Sunreef Mooloolaba, diving and swimming with the whales, contact via the web site, facebook page, phone or shop. 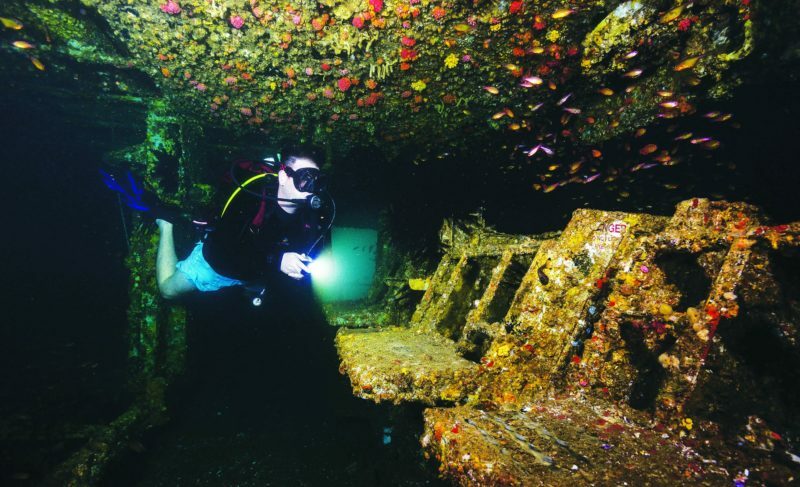 This scuba dive is fantastic for people ranging from open water divers to wreck divers. With penetration to most of the guided missile destroyer, divers can reach the engine room, boiler room and the weapons control room. 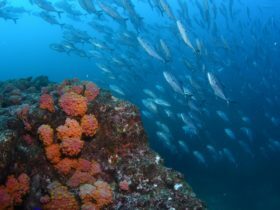 The wildlife includes large schools of fish, trevally and bait fish, along with resident bull and eagle rays, large Queensland grouper, cray fish, octopus. 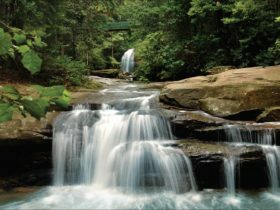 Water temperature ranges from 18 degrees in winter to 27 degrees in summer and visibility from 10 metres to 30 metres. 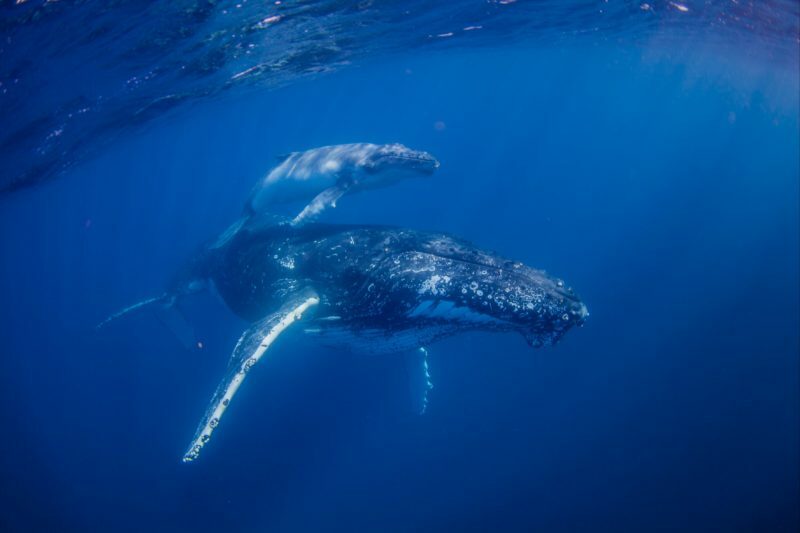 The opportunity to swim with a Humpback Whale is a rare and very special one, and Sunreef Mooloolaba was Australia’s first operator to offer the experience, launching in 2014. It’s a very special breathtaking experience that will leave you with a true sense of wonder about these amazing mammals. The experienced Sunreef crew will find and trail along at a safe distance from the whales to allow them to get used to the sound of the engines. Then, after assessing the whales’ behaviour, they will move ahead of the whales. If conditions are right, they will then put the boat into neutral and allow guests to slide into the water with a Sunreef guide and a safety line. 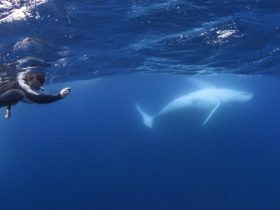 Then its up to the whales – its a natural experience and 100 per cent on the whales’ own terms. They seem as intrigued by people as people are of them and often swim over and around for a closer look, gliding gently and effortlessly around you. Operates from July to October each year. Please check with Sunreef for dates and more information. 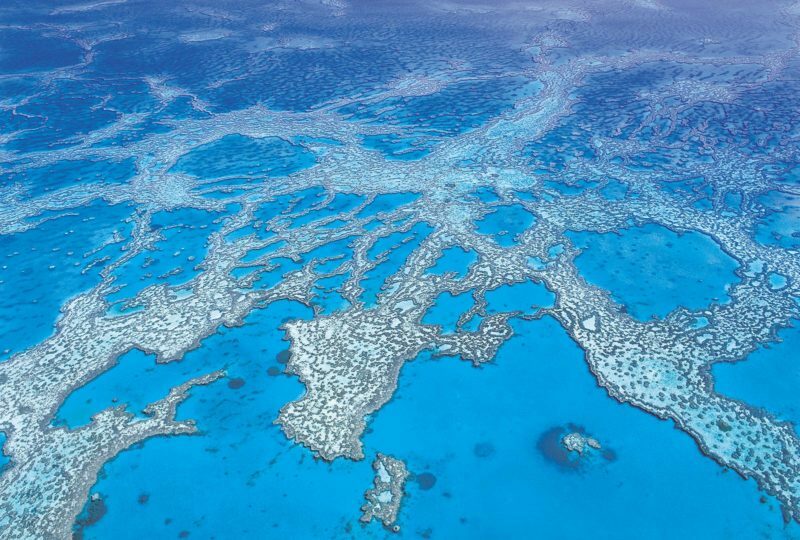 Flinders Reef is one of the most beautiful dive sites in Queensland. Haled by divers and snorkellers alike for its pristine conditions and stunning visibility year round. Flinders Reef is known for the abundance of different species of turtles, which inhabit the entire reef system. If beautiful coral reefs are your idea of the perfect dive, look no further. It has the highest number of coral species of any sub tropical reef system along Australia’s East Coast. Swim throughs and pinnacles are scattered throughout this reef with something new to discover each time. 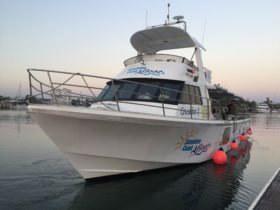 Sunreef is the only company on the Sunshine Coast currently offering full 60-minute dives at stunning Flinders Reef. The humpback whale migration is one of the most magnificent natural encounters you can have. You can feel the excitement all around as you look along the horizon for the first blow or splash from these gentle giants. These amazing animals can sense you near them and curiously swim up to see your excitement – get up close to experience their breathtaking breaches, loud tail and pec slaps, tail lobs, spy hops and performing their classic peduncle throws! 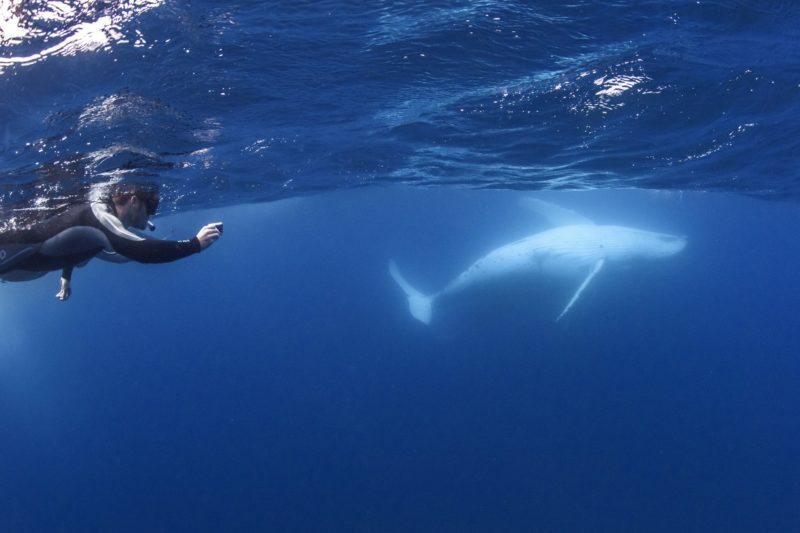 Join their friendly crew on board Whale One for an unforgettable adventure on the sea! 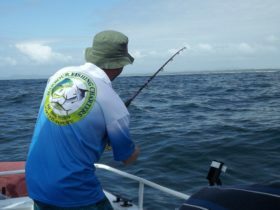 They have a 100 per cent guaranteed sighting or cruise again free or receive a refund when you book directly with them! Enjoy the comfort of the Whale One luxury catamaran with your friends and family as they cruise the Mooloolaba canals, taking in the spectacular views and stunning homes along the way. As the sun sets over the Glasshouse Mountains, the sky turns into a beautiful sight not to be missed. As they cruise, you can enjoy a beverage from their fully licensed bar, nibble on fresh complimentary canapés and finger food whilst listening to one of their talented local musicians. Ideal for birthdays, corporate events, anniversaries, parties and celebrations of all sorts!